On November 17, 1987 - only a few months after Who's That Girl - Warner Brothers Records released the remix compilation You Can Dance (the title was inspired by the Into The Groove lyrics). While remixes appear on albums and singles all the time nowadays, the concept of an album full of remixes was quite new in the eighties. At first remixes were only given to DJs to play in clubs and disco's and on the radio to promote the original song. However, people often got more interested in the remix version and wanted to buy it themselves. For record companies it was a way to sell the same product twice. It's no surprise that a business woman like Madonna tried the concept herself, though she did it with mixed feelings. She teamed up with friend and producer John -Jellybean- Benitez, a famous DJ himself. 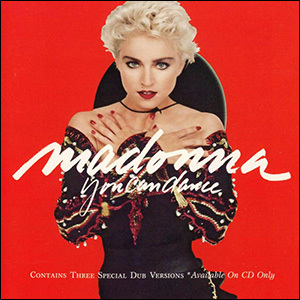 Madonna-collaborator Shep Pettibone remixed a few tracks as well. As an extra incentive, the album contained one previously unreleased track, Spotlight. You Can Dance sold about 5 million copies worldwide, becoming one of the most successful remix albums ever. In the US it was certified Platinum for shipments of 1 milllion copies, though with reaching #14, it's her only album to miss the top 10 of the US album charts. It also got to #2 (France), #5 (UK), #12 (Canada), and #13 (Australia, Germany). Additionally, a promo with edits of the remixed tracks topped the Billboard Hot Dance / Club Play chart.